"Remarkable new study...Its central submission, that we have hitherto disregarded or misinterpreted the most profound intuitions of a unique composer, certainly carries conviction. And even after one reading there are already musical passages that this Schubert enthusiast find himself hearing in quite a new way." - Bayan Northcott, "BBC Music Magazine". "A sensitive and richly allusive commentary...likely to change the way we listen to certain works." - Brian Newbould. The old stereotypes of Schubert as Bohemian artist and unselfconscious creator have been replaced over the past half-century with a picture of a difficult man in difficult times. 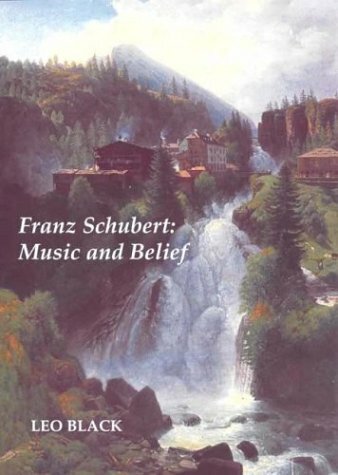 The author aims to redress the balance, concentrating firstly on works where Schubert's beliefs are clearly expressed (masses, other religious music, songs amounting to "Geistliche Lieder"). This also prompts an examination of instrumental masterpieces ("Unfinished and Great C Major Symphonies", and the "Wanderer Fantasy"), which show that Schubert's religious side encompasses awe and terror as well as wonder. Schubert's 'complete voice' is thus clearly heard, rather than the sombre one currently emphasised in both literature and concert. Leo Black is a former BBC chief producer for music.